The Ford EcoSport without a doubt is one of the most popular five-seater crossovers available in Malaysia. Years have passed since its launch in 2014, but the EcoSport continues to rule the segment. One thing that we however regret is its massively delayed facelift. The EcoSport has mainly remained unchanged, however, with changing time and customers taste Ford needs to take some major revamp steps. Also, the competition in the segment is increasing with new and high-tech models arriving one after another. However, thanks to EcoSport’s value-for-money stature paired with its strong outlook, it has been able to stay put in the field. The 200 mm of ground clearance and 550 mm of water wading capacity enables it to survive tough Malaysian terrains. The Malaysia-spec EcoSport source its power from the 1.5-litre Ti-VCT mill that’s mated to a 6-speed PowerShift gearbox. This engine not only helps you achieve best-in-class acceleration but also gives superior fuel economy. It is presently priced a little over RM 98,000. Have a question on Ecosport? Only your name will be displayed with your review. Your email id & mobile will not be displayed with it. Ecosport is available in 4 different colors - Absolute Black, Candy Red, Ingot Silver and Mars Red. Watch latest video reviews of Ford Ecosport to know about its interiors, exteriors, performance, mileage and more. The Ford EcoSport has been one of the most popular 5-seater crossovers in Malaysia, thanks to its value-for-money stature mated to a very beefy outlook. It was first introduced in the country back in August 2014 and was the Thailand-built model available at a starting price of RM 93,000. However, the car is presently priced a little over RM 98,000 on-the-road without insurance. The EcoSport is a wonderful car, inside and out and hence, is highly preferred. In fact, it is not only a great car to be had in Malaysia, but in other Asia-Pacific regions too. This baby SUV is sure to give you a second thought if you are determined to buy your first car. When it comes to the interior, the Ford EcoSport packs a punch with a humongous list of features on offer. To start things off, smart keyless entry is added to the package along with electronic automatic air-conditioning. The seats are wrapped in leather upholstery, albeit only on the higher trim. However, leather wrapped gear knob is given as standard. A multi-function steering wheel, with audio controls, is a part of the standard list. Apart from this, you will be impressed with the cooled glove box which comes in handy during hot summer days. As for the dashboard, there is a SYNC infotainment system which allows seamless connection with smartphones via Bluetooth or USB and facilitates phone calls too. You will love the way the Ford EcoSport is stacked up as a complete package. It looks like a hatchback that has been on a strict dose of steroid. The hexagonal front grille and the chubby bumper makes it look muscular, but not without the presence of a high bonnet. The black plastic cladding extends all around the car along the lower skirt. The wheel arches are body coloured but still very sharp. It rides on 16-inch alloy wheels that are wrapped in 205-section tyres. A sunroof is offered in the top-end trim too, which adds an advantage to the EcoSport over other cars in this price bracket. 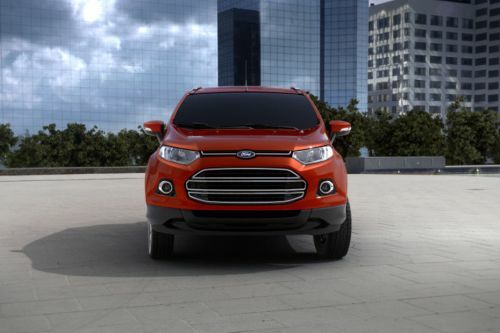 There is no denying the fact that the Ford EcoSport is known for its handling prowess. Once you get behind the wheels, you will feel that the car is way too nimble and offers the combined driving experience of a small hatchback and a powerful SUV. That said, it gets the MacPherson Strut suspension at the front and Twist Beam at the rear, something that seems to be a standard setup but offers good balance and stability. Plus, the tailgate-mounted spare wheel always comes in handy. Under the hood, Ford offers a naturally-aspirated 1.5-litre Ti-VCT motor. This engine is good enough to churn out a maximum power of 110 PS at 6,300 rpm along with a peak torque of 142 Nm, which comes at 4,400 rpm. Power is delivered to the wheels via a 6-speed automatic gearbox, something that the company calls the PowerShift. Though it might not be an outright powerful car, it still feels very nimble and frugal, thanks to the dual dry clutch setup on the engine. Plus, the 52 litres of fuel tank capacity turns out to be a big boon for long drives. If you are looking at the Ford EcoSport to be one of the safest cars in the segment, you might feel a little letdown for its braking. For a price tag that is a lot higher than the conventional hatchback, the front ventilated discs and rear drum brakes-setup seem to be a little low. However, the addition of ABS, electronic brakeforce distribution and emergency brake assist makes up for the downhill. Other important assistance features include traction control, electronic stability control, and hill start assist. As for the safety of the occupants, the car offers a total of seven airbags, covering everybody present inside the car in an event of a collision. The Ford EcoSport does turn out to be a really attractive package for first-time buyers or the people who are looking to upgrade from a small hatchback. It is powerful for its size and packs in a lot of features. Moreover, the presence of seven airbags inside the cabin makes things really safe for the occupants, proving that it makes for a great buy for its price. What are the Safety Features Available in Ford Ecosport? Please tell us about your car below and we'll connect you with our partner dealers.